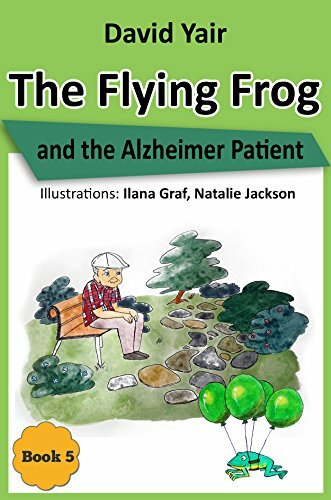 This is book five of The Flying Frog series, but it stands alone as an interesting approach for children to understand Alzheimer disease. The Rimon children are a clever pair of siblings who are adept at solving mysteries. They accomplish this task with the help of a flying frog named Quack. In Book Five of the series, Adam Shor is a retired carpenter who is beloved in his town. He is now in the advanced stages of Alzheimer disease. His wife. children and grandchildren watch over him. One day, he walks out of the garden gate. gets confused and lost. The whole town mobilizes to search for him. The Rimon children enlist the aid of Quack. They tie balloons to him and launch him into the forest. As the story unfolds, children begin to understand the complexities of the disease and the emotional upheaval that it evokes in the family and friends. This story is an excellent way to introduce a discussion about the topic to children. There are a few endearing illustrations that portray the emotional impact of the tale. The book is short at under forty pages, but I would have liked to have seen larger print for the targeted middle-grade audience. Recommended especially for readers in the eight to twelve age range. This looks like an interesting series. I would like to check it out! Thanks for sharing this at Booknificent Thursday on Mommynificent.com!